If you’re just now tuning in, check out Part 1 of this series! In Part 1 of this series, we looked at how the brain registers emotional experiences. The traumatic experiences, or chronic stress in response to those experiences, can literally cause your emotional amygdala to override your logical brain without your knowing it. All of us (even the most "left-brained, linear, non-emotional" thinkers among us) react, rather than objectively respond, to far more than realize. We engage in and become trapped in emotional patterns that cause toxicity and breakdown in our brain and body. It all starts when we experience crappy things in life, and then we repress our natural response of pain, fear, shame, or grief. We just "move on." This repressing creates a lie - and then, like stuffing a small crack when your ceiling is leaking...it will find another way out, wreaking worse damage on your structure as it does. Some of that damage from emotional patterns shows up physically as the effects of excess cortisol (poor digestion, weight gain, adrenal problems), and some shows up as actual disease or weakness in specific parts of the body. What if there were a way to process and release nagging emotions like stress, grief, fear, and frustration, be they subtle or suffocating? What if there were a physical way to help your "fight/flight/freeze" response take a back seat? What if there were a way to calm that amygdala, and allow for clarity of thought and objectivity? What if, instead of burying your emotions until they erupt, you were able to process and release them in a healthy manner? Essential oils are just another tool in your wellness toolbox. Other tools definitely include taking days of rest, exercising, and being in community with others. But essential oils are a very powerful and effective tool that literally connect the disconnect between the logical brain and the emotional, impulsive, fight-or-flight part of the brain. Even if you tell yourself to "have faith", and "believe things will all work out" ...sometimes, there is hardwiring that needs to be un-done first. Sometimes, we just need to say "No" to the pattern, and set ourselves up well to stop the cycle. Personally, I have been discovering over the past 2 years some deep-seated issues that I had no idea were present. The fight-flight-freeze responses were very real. My thought patterns were unhelpful. I didn't even recognize some of the dysfunction and negativity I operate in..
"Logically, I knew to be anxious was unhealthy. But real-ly, in real life, there was a major disconnect. Logically, I knew to "cast my cares" and even did it, spiritually. But real-ly, in real life, there was still a disconnect. My racing heart, my clenching teeth, my stress-dream-producing mind...they just didn't get the memo that I'm supposed to not be anxious. Or frustrated. Or afraid. Oh the patterns. Why were they so stubborn?" Why? Because of the amygdala, the buried emotions, and the resulting personality patterns. Plus a little denial from the logical brain. When I'm experiencing a stressful situation, to help my brain relax and just "let it go"
But are Oils a replacement for "Faith?" Essential oils were created to physically help your brain and emotions be in alignment, so things function the way they were supposed to. So oils help with faith. But can I tell you what hurts your faith (and mine)? Those stress patterns that oils were created to release. Your conditioned fight/flight/freeze fear response in your emotional brain. And your "I don't have any buried emotions/I don't believe any lies" protest of your logical brain. In other words, fear and denial are faith-killers. In order to truly have "faith," there must be freedom from that fear and denial. There must be truth, and agreement between your "thinking" and your "feeling" - between your brain and your heart. Scientifically - there must be agreement between your logical, prefrontal cortex and your emotional memory-filled amygdala/limbic system! Your "fight/flight/or freeze" response needs to calm down, and at times your logical brain needs to step back and allow some of those buried lies to come to the surface. And oils are just the unique tool that help facilitate this. They help your brain and heart align with your choice to stop the cycle of harm. Essential oil molecules go up through your nose, to your olfactory bulb, which connects directly to the emotional limbic system of your brain. The various types of molecules work automatically to calm the emotional responses. For past patterns and buried emotions (such as those from death of a loved one or a childhood wound), the molecules work to calm reactions to triggers, release the negative patterns, and bring clarity to memories that get distorted with fear and shame. For present-moment stressors (like rush hour traffic or a hospital visit), they help you to not react but to respond. They help you just "let it go", telling your amygdala it doesn't need to react to the stressor to protect you...it's really going to be okay. And what's really cool, is that the only one of our five senses that can bypass the conscious mind to access the amygdala is our sense of smell. Smell works via our subconscious, making essential oils really, really convenient for our emotional health! The Romans used them to calm their fear and fortify their mind before heading into battle. Hebrew worshipers were made to smell frankincense, myrrh, and cinnamon in the Temple to clear their mind of anxiety and awaken their soul to engage in wholehearted worship. Jasmine oil has been used for millennia in India, Persia and other countries as an aphrodisiac, releasing inhibition and stirring feelings of attachment. Those who were deeply grieved or distraught in the Biblical world were anointed with a physical oil of gladness to release the grief and stir joy in their hearts. If you're in the area, you won't want to miss this "Oils of Ancient Scripture" class the next time it comes around! I'm planning to do one next month- so email me if you want to come! These oils have been around for longer than the Bible itself. God made aromatic plants with flowers and leaves for the healing of all nations, physically and emotionally. Young Living has over 200 essential oils and blends of essential oils, the purest grade available, extracted delicately and perfectly, with no solvents or artificial fragrances (like most other "pure essential oils" out there). They have been around for over 25 years, they were the first to distill essential oils this way in America, and the first to develop these recipes of blends. You will see many imitations out there, now that "essential oils" have become so mainstream! Gary Young was a brilliant student of chemistry, energy frequencies, and the emotional benefits of essential oils. He developed his blends with the utmost care, and the most ingenious reasoning and intentional methods of blending. While I thought this was a bit wacky 2 years ago, I'm going to SAY IT because I have absolutely experienced it myself and I now understand some of how it actually works! 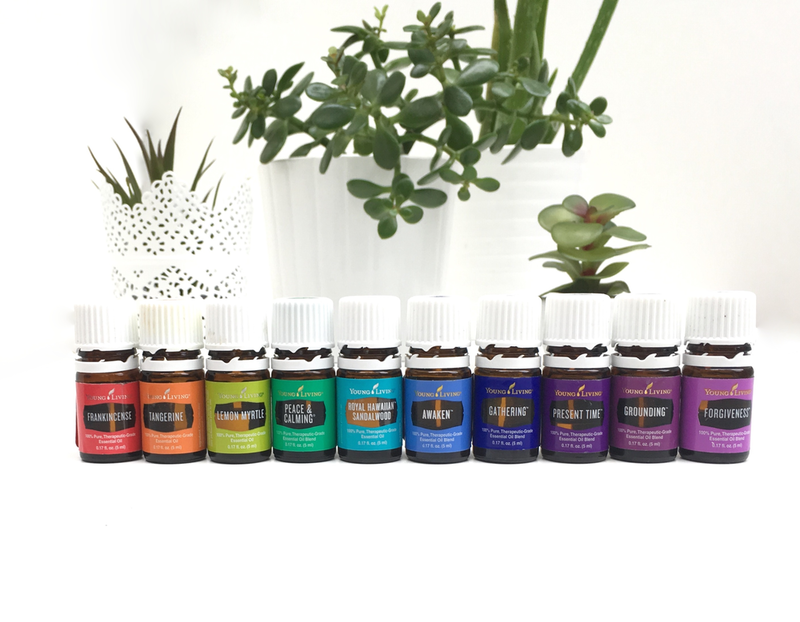 The "emotional blend" names are very intentional, and the oils in them were selected and combined in very particular ways to provide a beautiful, harmonizing balance to the human brain for emotional support. The uses/benefits of the blends go far beyond the name on the label, and there are several specific techniques for releasing negative emotional patterns to achieve balance emotionally and protect your body physically. And speak LIFE over yourself as you apply it, to replace the LIE that your mind and heart have believed for far too long. You will feel a difference! Click here for Part 3: Which Oils do What…and Why!